From Start to Finnish: Architonic surveys Scandinavian design hero Tapio Wirkkala's remarkable..
With leading Finnish design brand Artek reissuing two of its fellow countryman Tapio Wirkkala's striking designs from the late 1960s and early 70s, as well as first-time-round, 'vintage' pieces of his being shown at international design fairs such as Design Miami Basel, now is the time to look back at the work of this highly productive designer, whose contribution to postwar Scandinavian design was as major as it was diverse. 'Domus', the iconic and authoritative Italian design journal founded in the 1920s by architect-designer Gio Ponti, did much to disseminate images of, and commentary on, Finnish design to an international audience from the 1950s onwards, but the work of one its countrymen more than any other was to appear in its pages with great regularity: Tapio Wirkkala. Indeed, Wirkkala, who trained as a decorative carver but went on to become a key figure in Scandinavian modernism, was included in the pantheon of prolific designers' names that featured in the masthead of the magazine from the early 1960s until 1973. 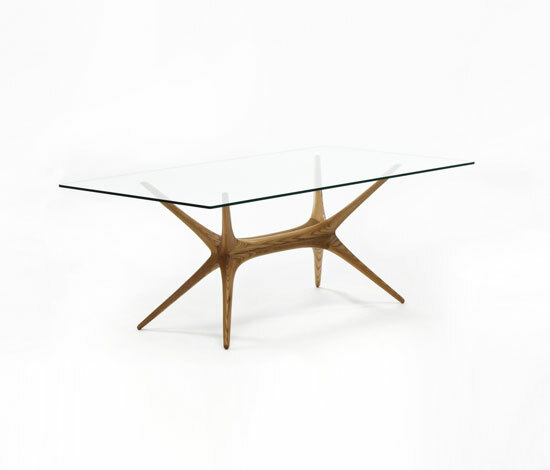 Established by renowned architect and fellow Finn Alvar Aalto in the mid-1930s, the design manufacturer Artek has recently paid homage to Wirkkala by putting into production two of his designs from the late 1950s and early 60s – his X-framed, glass-topped table of 1958 (the leg construction consisting of laminated birch or elm), and his strikingly geometric, lacquered-birch-based table lamp with plastic shade (called 'TW001' in its current issue), which was designed a couple of years later. But the reason for Architonic's revisiting of Wirkkala's prodigious and varied body of work extends beyond the reappearance of these two pieces. As design becomes ever more global – in terms of, among others, aesthetics, manufacturing and consumption – Wirkkala's design practice, which was so instrumental in the shaping of a specific Finnish national profile on the international design stage, provides an interesting counterpoint. In spite of the object types Artek has chosen in their re-presenting of Tapio Wirkkala – a table and a lamp – it is another that proved to be the mainstay of his creative expression: decorative glasswork. 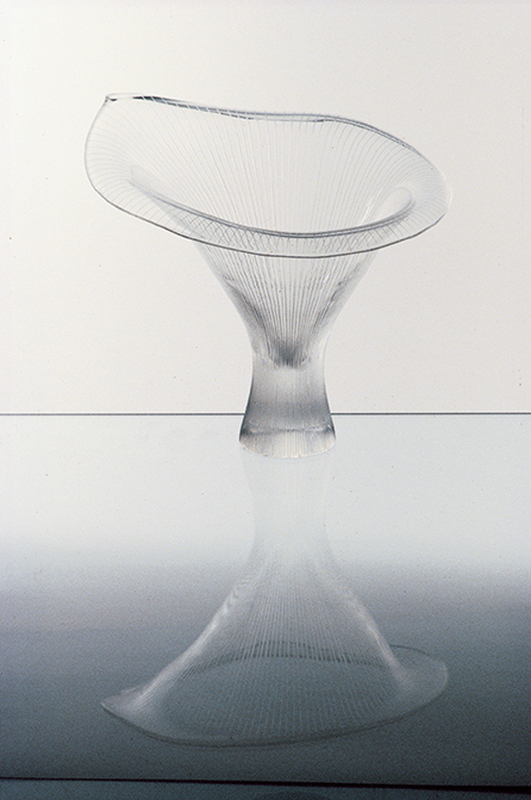 The at times diffident and difficult, but always quick-witted and articulate, Wirkkala was responsible for a prodigious body of design in glass, which, perhaps, at first glance, appears to fit somewhat (too) neatly into the familiar Scandinavia/nature equation, informed as many of the pieces are by natural forms and textures. One such piece is Wirkkala's 'Kantarelli' (Chanterelle), a vase first produced by Finnish glassworks Iittala in 1948 that was to become a limited-edition series, whose flared shape and fine-lined surface cuts speak clearly, albeit in a highly poetic way, of the organic. Having won a competition organised by Iittala, Wirkkala was employed by the company from 1946 and went on to design more than 120 objects under its auspices up to 1951, all of which went into production. Such industriousness was matched by an intensity of personal creative process: for each glass object, the designer made hundreds of sketches. 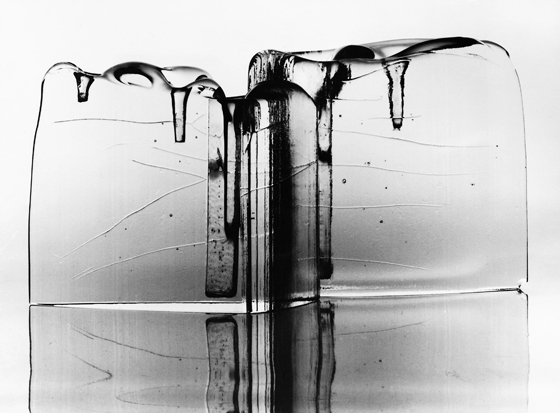 This kind of honing, this virtuosity is perhaps what gives Wirrkala's work its richness and value. 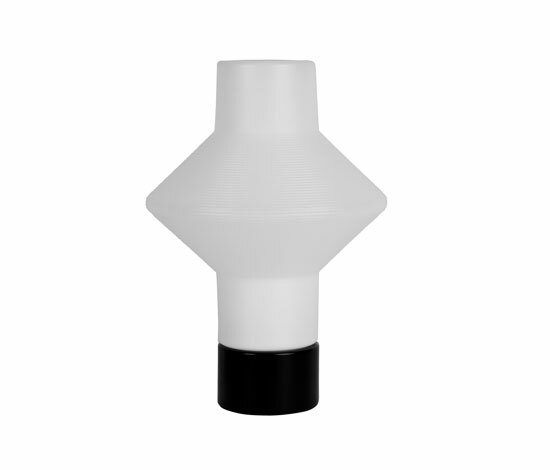 These are industrially manufactured products that convey a sense of the designer's hand. Indeed, Wirkkala's 'puuko' or carving knife was never far from reach. It was an extension of his hand, if you will. Indeed, he was to design a number of these knifes himself. While a bad workman blames his tools, Wirkkala decided to make his own. It's not surprising to learn then that he who would often carve the moulds, even the metal ones, by hand for his industrially produced glassware. 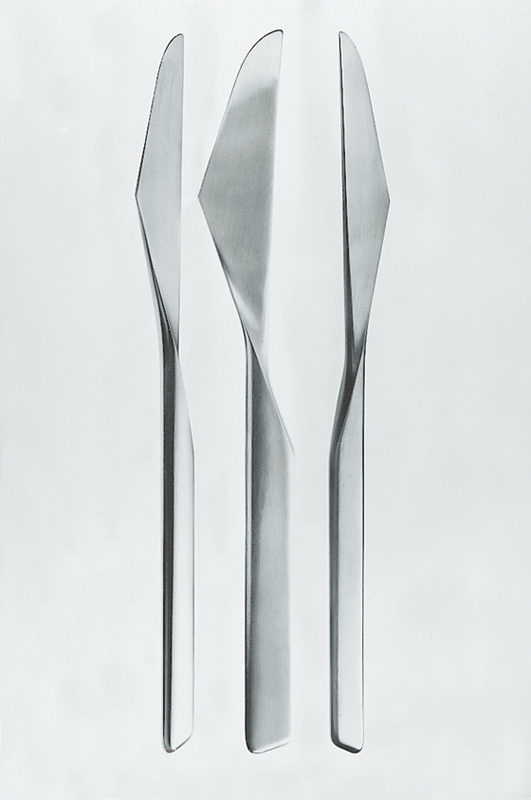 'Kantarelli' was shown as part of the Finnish exhibition at the 1951 Milan Triennale, at which Wirkkala was to win three Grand Prix – for his glassware, wood sculptures and for the design of the exhibition itself. Milan was good to Wirkkala. It was not only here that he met Gio Ponti, but also where his work was to receive an international, highly receptive audience. 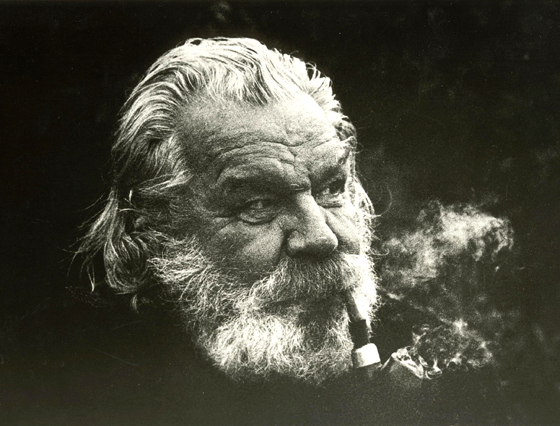 For as much as Wirkkala was involved in a literal form-making that was bound up with a lending of form to the idea of postwar 'Finnishness' (this was a man who often sought sanctuary away from the modern world in his Lapland cabin), he was also an international designer whose contributed to the border-crossing design language of his time. The rational formalism first promoted in the 1920s by the likes of the German Bauhaus had a new relevance following the Second World War, in particular in a country like Finland, for whom material privation was nothing new, and which had little tradition of making luxury goods. Designing in the 'Finnish way', with its pared-down aesthetic, was, therefore, also to design in the international style. Such a duality of expression in Wirkkala's work aided his reception beyond his home country's borders. In 1951, Wirkkala was, along with Dane Hans Wegner, awarded the Lunning Prize – a plaudit created to recognise eminent Scandinavian designers – while the 1954 Milan Triennale saw his work pick up another three Grand Prix. Testament to Wirkkala's internationalism was his collaboration with a number of leading manufacturers. 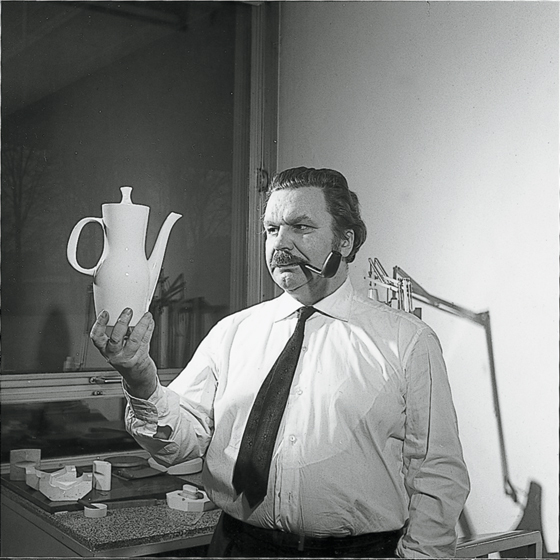 Having moved to New York in 1955, at the height of Scandinavian design's popularity in America, to work in industrial-design legend Raymond Loewy's office, Wirkkala met the German porcelain producer Rosenthal, with whom he began a partnership that would result in a series of memorable ceramic products, at once sculptural and functional. 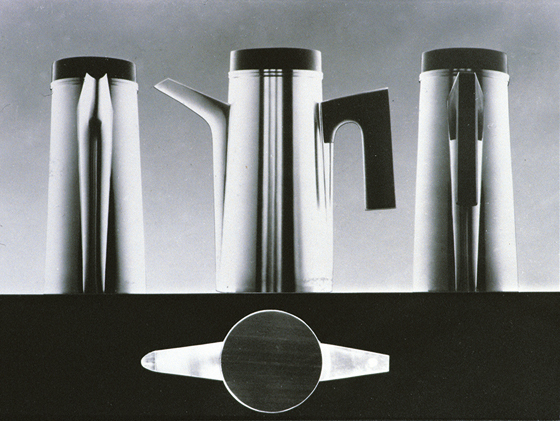 Rosenthal had, up until then, commissioned only American designers or worked with older Bauhaus designs. His 'Finlandia' table service of 1957 (whose name emphatically foregrounds its designer's national identity), with its graceful contours and idiosyncratic, asymmetric handles, was the first of these. 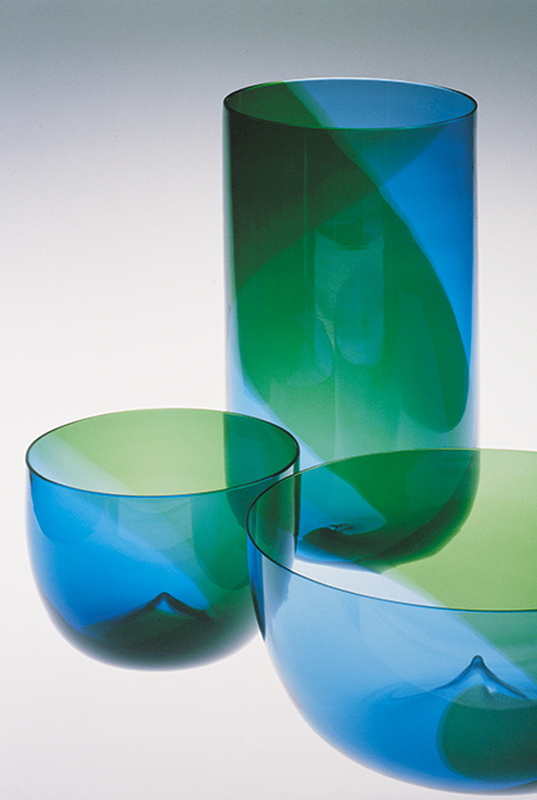 A further collaboration was to develop between Wirkkala and the Murano glassmaker Venini, for whom the Finn designed a highly graphic collection of glass objects that made a much greater use of colour in their designs, compared to the visual language of Iittala, which favoured clear, colourless glass that relied more on three-dimensional form for its expression. 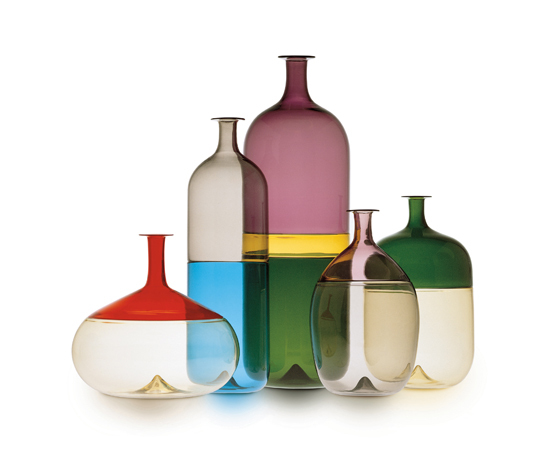 Wirkkala's 'Bolle' bottles collection from 1966/67, with their two-colour treatment and bulbous or elongated forms, with contrasting narrow necks, has a particularly strong optical presence. But to focus purely on Wirkkala's high-value glass and ceramic products, in spite of these constituting the lion's share of his work, is to underestimate the breadth of his creative activity and its significance. If prewar international modernism was avowedly ideological in its desire to make society a better place through well-made, machine-produced, well-functioning objects, available to all, then the values of social democracy, of equality and humanism, that were to be found in Scandinavia after the war provided the ideal environment for this kind of socially conscious design. It is this idea of a democratic design for the everyday that Wirkkala's work beyond the high-end design brands of Iitala, Rosenthal and Venini expresses. The 1960s saw Wirkkala design a number of consumer goods, from distinctive plastic ketchup bottles to a new glass bottle for vodka brand Finlandia, which, when exported, arguably did more to construct a certain image of the country abroad than any of his other objects. Beyond the bottle's utilitarian function, its highly figurative form – the main reference in which is clear (the icy Arctic landscape) – invited the consumer to keep the object, after its primary use, as a piece of 'authentic', decorative Finnish glassware. But it is perhaps his work with the aviation industry where Wirkkala's work reached its widest audience. If the designer's engagement with (and, indeed, his contribution to the creation of) the representation of Finland in the postwar period, a kind of national identity expressed materially, a sort of 'Finnishness', can be seen throughout his work, then the products he designed for national flag carrier Finnair (formerly Aero) can be taken as the ultimate examples of this. Used by thousands of passengers, his glasses, cups, dinner services and cutlery were not only aids for a literal consumption, they were also devices in a representational economy, objects that were themselves to be consumed as part of an 'genuine' Finnish (albeit 33,000-foot-high) experience. They were a design currency that circulated both literally (throughout the world) and metaphorically. Wirkkala's 1960 commission from Aero for a plastic cup to be used on the airline's new Caravelle aircraft took a cue, Gesamtkunstwerk-style, from the form of the planes' tails, in a move that sought to suggest an equivalence between Finland and technological modernity. In first-class, passengers enjoyed Wirkkala's white plastic dining service and stainless-steel cutlery (the knife inspired by the aerodynamic form of the jet's wing). Design contemporary Ilmari Tapiovaara was responsible for the aircraft's interiors and the blue-and-white graphics. Finnair began transatlantic flights from Helsinki's Vantaa Airport to New York in 1969 on its new DC-8s. 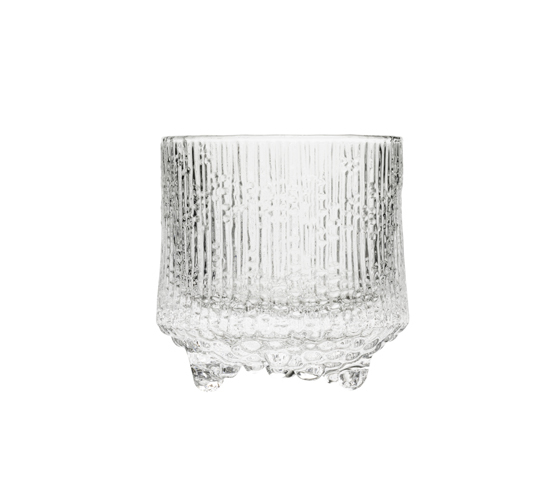 Wirkkala's 'Ultima Thule' glasses, produced by Iittala and which had first appeared a year earlier, were chosen for use on board. The moulds, in true Wirkkala style, had been carved by hand, first in graphite and then later in metal. Despite the discontinuation of Finnair's first-class service in the 1980s, the glasses, with their icy aesthetic, are still used on special flights, evidence of the connection their users make with them. It is precisely this connection, encouraged by Wirkkala's humanist approach to design – one characterised by an international, modernist formal language, yet at same time conveying a sense of the designer's hand and of his Finnish soul – that guarantees the continued relevance of his work, something that Artek, in their reissuing of his designs, have recognised. For objects that not only function well, but also encourage us to invest in them on an emotional level, are those that are less likely to be discarded in these days of hyper-consumption. And that can't be a bad thing. The Tapio Wirkkala Rut Bryk Foundation, established in 2003, maintains a collection of several thousands of objects and works of art, original drawings, designs, photographs and transparencies of the work of designer couple Tapio Wirkkala and Rut Bryk.